From his first interactions with “The Mob” in his early childhood, his nightmarish life with his father until he was on his own at 15 years of age, through his marriages, and how he became one of the best and most famous stand-up comedians of his time, Kip Addotta tells all. He names names and details the how-to and fine-tuning of comedy. Pat Cooper--How Dare You Say How Dare Me! 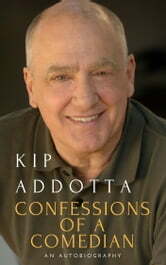 Now, I must admit that I never really knew who Kip Adotta was, and I didn't really need to know that when i started reading the book. Now, I know more about him and his story. There is a sense of survivalness behind that comedian, and I'm guessing, he has a lot to build upon with his humor. The writing is wonderfully put together, and his story is laid out for the entire world to read. There is always more behind the celebrity than people know, and this story shows it. Anyone who reads this may become a fan, if not one already, and I've just become one, not just of the comedian, but the writer as well.